Combine effective listening skills with the 10 second rule in team coaching, your entire business and your whole life! When working with customers or coaching your marketing consultants, the 10 second rule will improve your results. It is a very simple rule that takes a bit of practice to incorporate into your life. The 10 second rule is: Share for 10 seconds or less and ask a question. When you share for less than 10 seconds and always end in a question you will keep the focus on the customer or your coaching client. When they are answering your question, you must listen very carefully to the answer, then use that information to drive your next 10 second response, then ask a question. The key is to listen to the answer, then when it is your turn again share information clarifying what they said and end in a question again. An effective business coach uses the 10 second rule and practices good listening skills. Using the 10 second rule in your business will bring your team more success. 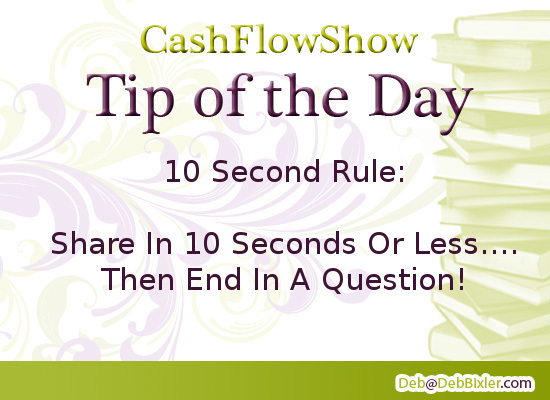 Learn more about how to use the 10 second rule on the Cash Flow Show website. Deb Bixler is the 2011 DSWA Speaker Of The Year and the DSWA party plan adviser.